The model allows the user to define a “schedule” according to which a policy will be implemented. This feature allows users to phase in policies in any years they prefer, and according to any shape curve (linear, sigmoidal, etc.). Additionally, it allows users to model policies that expire- for instance, by enabling a policy for a number of years, then disabling it at a later year during the model run. Like the model’s input data, policy implementation schedules can be edited using a spreadsheet program such as Microsoft Excel or Open Office; a version of Vensim capable of editing models is not needed. The “Fraction of Policy Implemented This Year.xlsx” file has two tabs: About and FoPITY. The “About” tab provides some guidance on how to use the file to specify policy implementation schedules. The “FoPITY” tab specifies the schedule for each policy. The default R&D policy schedule reflects the idea that additional investment in R&D achieves progress slowly at first, as staff and laboratories gear up, acquiring skills and knowledge. Progress is faster in middle years, then slows down again as the easier technical questions are answered, leaving the more challenging technical problems to be solved. The future progress of technological research cannot be known in advance, and the curve specified here is meant to be a reasonable example. 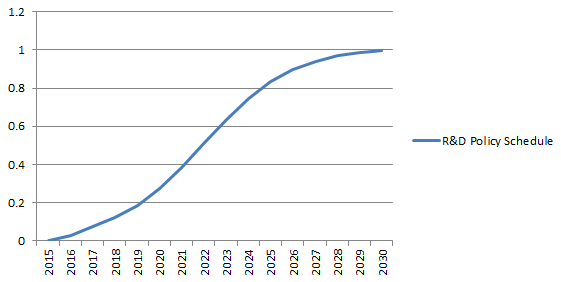 When specifying your own curve, it is not necessary that the entire S-shape be visible within the model run period of 2015-2030. Since we are concerned with an additional R&D commitment, generally the curve should start relatively flat (as even a technology that is well along its own S-curve will nonetheless respond gradually to a change in its level of R&D investment). However, there is less reason to believe that the inflection point for additional R&D commitment will necessarily be reached during the model run period: a curve that starts relatively flat and grows at an increasing rate through 2030 could be plausible for some technologies. It is generally best to make a copy of the “Fraction of Policy Implemented This Year” spreadsheet before changing the policy implementation schedule. After you have adjusted the schedule, you must export the “FoPITY” tab of the spreadsheet in comma-separated values format (.csv) to a file named “FoPITY.csv” in the same folder. This should replace the “FoPITY.csv” file included with the model distribution. In the default policy implementation schedule, policies are never weaker in a later year than they were in an earlier year: either they remain at full strength (a value of “1”) throughout, or they linearly approach full strength in 2030. However, there is nothing to stop a user from specifying a policy implementation schedule that reaches “1” and then declines. For example, one could explore a scenario where a subsidy for electricity generated by solar PV starts high and declines over time, as the technology matures and less policy support is needed. One could also explore a scenario where a policy becomes strong, then expires, abruptly returning to a value of zero. When you specify a policy implementation schedule, you should ensure that it reaches a value of “1” in at least one year. This is because “1” means the user’s policy setting is fully implemented. If you want the policy to be weaker, you should simply set a less-strong setting for the policy itself, rather than using an implementation schedule that never fully implements the policy. To create a schedule that does not include a “1” value in any year can cause confusion, as a user wonders why the setting that he/she specified in the model using the policy levers is not reached in any year of the model run. Similarly, you should never specify a value greater than “1” in the policy implementation schedule, because this violates the assumption that “1” means full implementation of the user’s setting. If you want the policy to be stronger, you should increase the strength of the policy setting, not implement more than 100% of the policy. Lastly, you should never specify a negative number in the implementation schedule, because this will cause the policy to have the opposite of its intended effect and/or will cause the model to function improperly.